By Nick Meynen and Daniela Del Bene. When top environmental journalist Fred Pearce wrote “Water, the defining crisis of the 21st century” in 2007, water conflict cases in the region defined by the reach of Himalayan waters were brewing and abundant. Now, as this article in The Guardian pointed out last week, things are edging ever closer to boiling point. China and India are entangled in a new Great Game of Asia. On top of their own building spree they’re busy buying or bullying for influence in neighboring states in order to control Asia’s water tower. The Himalaya provides water to a vast majority of all Asians. The legitimate concern to provide water to it’s citizens and protect it from floods conceals that short-term prestige, financial gain for a few and national pride have become arguments that override the long-term benefit of it’s own people or ecosystem. Through these ill-judged arguments, real solutions at local scales are neglected in favor of Big Dams – who have recently staged a remarkable comeback. According to this World Bank 2009 document, hydropower comes back as top priority for African and Asian countries for coping with climate change and their need for energy. World Bank president Jim Yong Kim stated that moving out from hydropower was a big mistake for the bank , while adding that “things have changed”. Nevertheless, the reasons for that move out during the ’90s – after the Morse report and its critical assessment of the Indian dam Sardar Sarovar – are still all there. Minor things might have changed but not the real, biophysical factors and the most problematic political conditions and inequalities. The economic benefits of the mega-projects are very temporary and can often better be described as shark loans with a high but hidden interest rate: none of the huge dams factor in the almost inevitable future bursting or decommissioning cost. As the reservoirs fill up with everything the rivers takes down, there’s always a day when they need repairs. That day usually comes earlier than the project-developers estimate. Even in the short term, economic, environmental and social benefits and costs are distributed highly unequally and almost always add to the growing inequality and internal tensions. In India, rehabilitation packages have failed everywhere for several reasons. Underestimation of affected people, lack of money for building new houses, failures in the resettlement process, corruption, lack of farming land are just some of them. However, the most problematic and unfortunate is the lack of political will, collusion with private interests and negligence of local authorities. Even experts’ assessments and analysis have been disregarded, as historian Ramachandra Guha observes; better to get rid of negative opinions of some critical scientists rather that putting at stake such glorious projects. Popular resistance to Big-Dam projects are going on ever since the first were built, but with climate change and ill-planned mountain development increasing the number of big floods – and dams being sold to the people as a flood protection measure – the stakes are rising fast. The recent Uttarakhand floods, in the North of India illustrate the point. In June 2013, a multi-day cloudburst centered on the North Indian state of Uttarakhand caused devastating floods and landslides in the country’s worst natural disaster since the 2004 tsunami. As this region is a hotspot for pilgrims and the pilgrimage season was in full swing, it took a long time for the government to come up with a reasonable estimate of the number of deaths. After a month of collecting information from all over the country, the government decided to pay compensation to relatives of 5,748 that have presumably lost their lives in the floods – although only 580 bodies have been recovered. Rainfall was exceptionally high – but many experts claim we should not look to the clouds to find culprits. The official storyline by the government and project developers will be that these are temporary problems that will all be over once the dams are build and floodwater can be stored. Such arguments are used to justify most Big Dam projects. But what happens if big dams are full when the monsoon is only halfway? Turns out that this is now the case with a very big dam in the same Uttarakhand region. Himanshu Thakkar of South Asia Network on Dams, Rivers & People (SANDRP), said, “looking at the data trend in the past month it seems as though the Tehri Hydro Development Corporation (THDC) is preparing to repeat the disaster the Tehri dam created in 2010.” The permissible Full Reservoir Limit (FRL) of the Tehri dam in North India is normally 820 m. On September 19, 2010 the water level reached 830m and the dam authorities had to suddenly release a huge quantity of water from the Tehri dam. 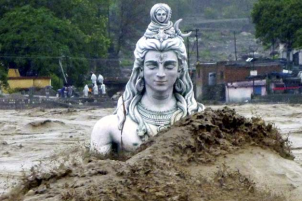 The waters submerged hydropower machines, including transformers of the under construction 400 MW Koteshwar dam, villages’ land and many more inhabited areas, including the Triveni Ghat in Rishikesh and Har Ki Pauri in Haridwar. Vimal Bhai, a member of Matu Jan Sangathan, a grass-root organisation working on dams and land related issues together with the project affected communities, said last July, “the THDC authorities claim to have saved the areas downstream of the dam from the flash floods in June (those that caused the flooding discussed above); but what about the present situation?” SANDRP already debunked the myth that the Tehri dam prevented a much worse flooding in Uttarakhand in this detailed analysis of events. They argue that the dam is actually posing an even bigger flood threat. And that threat is become real as we speak. The power generator, THDC, seems unconcerned. It is seeking Supreme Court permission to take the water level to the highest possible 835 m from the current permissible 820 m to create even more power, but that is unlikely to be agreed by the Uttarakhand government considering the state of upstream rehabilitation. The case is likely to come up before the Supreme Court in Sept 2013, as per Matu Jansangthan, which is fighting the case. That is only the latest in a long history of court cases and other resistance to the dam. The Tehri dam is an emblematic case in the state of Uttarakhand, where today 680 dam projects are in various stages of planning or construction. It’s an astonishing number for such a fragile mountain region and it’s alarming lots of experts and activists in India. The India Climate Justice collective published a statement soon after the floods in June, clearly pointing out how the tragedy has been caused by combined factors. Extensive deforestation of mountain tracts, soil erosion and water run-off, destabilized mountain slopes, unchecked hill tourism and vehicular traffic, spread of roads not suitable to this mountainous terrain, construction of poorly designed and unregulated hotels and structures, and sand mining along river banks are the main ones. Uncontrolled “development” process in Uttarakhand reflects therefore a blind conception of regional planning which easily turns out to be irresponsible and complicit policies. “This tragedy is also a crime, because our policy makers and administrators are also part of the larger climate injustice at a global scale that threatens, displaces and kills the marginal and the poor everywhere”, the collective states. The Himalayas have been heavily targeted in the last years by the dam industry, both private and state owned enterprises. Carbon Trade projects set up through the Clean Development Mechanism (CDMs) are also responsible for aggravating the situation today; they are attracting companies and funds while not actually contributing to carbon emissions reduction. It’s therefore more and more urgent to question this kind of development model and intervention plan in such a fragile mountain environment, as well as unveiling climate change discourses under which the new dams are being planned. EJOLT will contribute to this task, describing the most relevant conflicts around dams in the Himalayas, and framing them under a socio-environmental justice perspective. Many of them will be featured in the interactive World Map of Environmental Injustices – which we now plan to launch early 2014. The Supreme Court on Tuesday said no to new hydroelectric projects in Uttarakhand, which was recently devastated by massive landslides and flash floods killing hundreds of people. The court directed the Ministry of Environment and Forest (MoEF) not to grant further clearances for hydroelectric power projects. The apex court even asked the government to examine if construction of hydro projects was responsible for the recent Uttarakhand tragedy. The court also directed MoEF to constitute an expert body to make a detailed study as to whether hydroelectric power projects existing and under construction have contributed to the environmental degradation and if so, then to what extent.